If you're looking for a case for your Google Nexus 7 (2013) version, Speck has a minimalist yet stylish option for you. Check out the StyleFolio case from Speck Products. There’s many reasons the Nexus 7 tablet is popular. One of the main reasons is its size and portability. 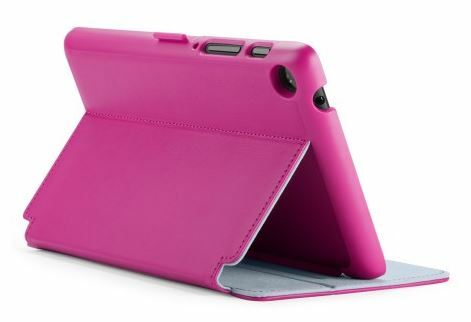 Since you want to keep the thinness of the tablet, you have to be careful when choosing a case. You want one that offers protection without too much bulk. I’ve used Speck products before so when researching I looked to them when searching for a decent case. Just in time for the release of the 2013 Google Nexus 7 tablet, Speck released a new addition to their lineup, the StyleFolio (soon to completely replace the FitFolio) case. I’ve previously owned and was satisfied with the FitFolio so I definitely wanted to check the StyleFolio out. It seems that outer shell of the case where you insert the tablet is a bit stronger than the FitFolio version. I like the sturdiness without too much bulk. It cradles the tablet nicely, without going over the bezzle. It’s a nice form of protection. Even though the tablet is cradled, the ports are open and accessible. On the outside of the StyleFolio, the cover is smooth. Unfortunately for the Nexus 7 (2013) versions there are no designs just solid colors. 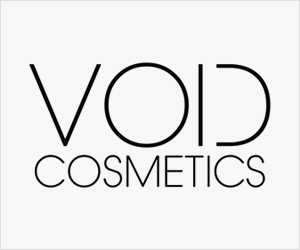 Black/Slate Grey, Deep Sea Blue/Nickel Grey, Fuchsia Pink/Nickel Grey. Take a big guess at which color I got. I got the Fuchsia, not only because it’s girly, but because it would stick out the most from everything. The StyleFolio features a locking clasp to keep the cover from flipping open. You can also keep the cover open behind the tablet with the clasp. There is no magnetic closure on the case. On the inside of the cover there are a couple of ridges which allow you to prop the tablet up for video watching. There aren’t that many cases for the Nexus 7 out there. The Speck StyleFolio brings modest style and protection without the annoying bulk. I prefer some of the designs they have for the iPad StyleFolio cases. But the Speck StyleFolio serves its purpose without making the tablet bigger, which was really my main concern. For those who have iPad Airs and iPad Minis, Speck has StyleFolio cases for those tablets as well. I’m sure you’ll find something you’d like. StyleFolio case fits Google Nexus 7 (2013). All-around protection. 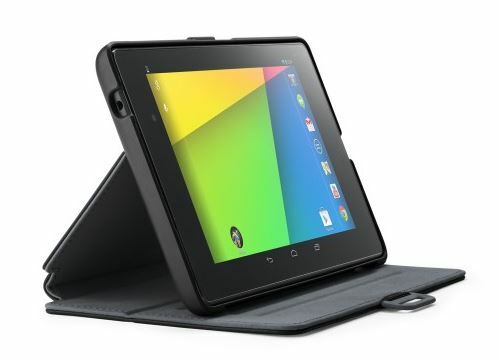 A form-fitting outer shell is reinforced with a soft anti-scratch inner lining to save your Google Nexus 7 (2013) from accidental bumps, drops, and spills. You can breathe a sigh of relief now. Locking clasp. Secures Google Nexus 7 (2013) in chic contrast color accents in folded mode or shut for when you’re on-the-go.